I currently have a list in SharePoint Online where project requests are logged and approved. Essentially, a list item (a project request) will go through a series of approvals by different people, and once the final approver reviews the request, a project number is added to a 'Project Number' field to mark its completion. Until all people have approved, this project number field is left blank. It's only when it's filled in at the end that an email is fired off to the original requester to notify them. I have set up a very basic workflow that runs every time a list item is changed. It simply fires off the email if the project number field is equal to 'not empty'. This workflow works great when the project number is first entered. 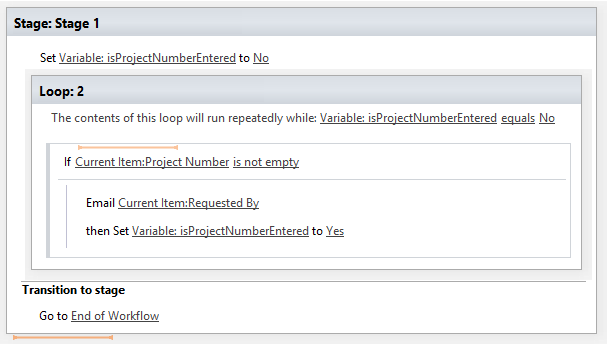 However, if a user then modifies another list item field after the project number is entered, this workflow is triggered again, resulting in the email being sent again. I need a solution where, if the email is sent, this workflow will not run again. I attempted something like below where a variable is used to try and end the workflow if the project number is entered. However, since the entire workflow is triggered every time a list item is changed, the variable just gets reset over and over and the same issue persists. You will set this WFdone to 1 after sending email before you will end workflow. If you're using SP Online/O365, try building your workflow on Flow - it's much more robust in built-in features and dynamic fields, and more capable for building customizations. Not the answer you're looking for? Browse other questions tagged sharepoint-online list workflow designer-workflow or ask your own question.